Snappy Dogs was the Friday the 13th stop on the National Hot Dog Month 2012 Tour. 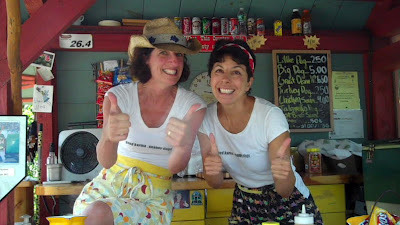 Teresa and Lisa, those wild and wacky Snappy Dog gals, were in rare form today. Friday is the day Snappy Dogs puts Lisa's Cordon Bleu chef training to the test because that's the day Snappy Dogs has their special, gourmet dog of the week! I challenged Lisa to come up with an extra special Friday special and she did not disappoint. If you didn't know, Snappy Dogs is located in the parking lot of Colella's Market, at the intersection of route 85 and 135, in downtown Hopkinton, Massachusetts. The ladies are in their fourth season of grilling up Pearl all beef franks with delicious, gourmet style, home-made toppings. I have worked on their trailer in the past, and as it turns out, it's a good thing I was there today. Lisa had an emergency- her daughter needed a tow- so I was pressed into service in the middle of the lunch rush for about an hour. I went there to film a Hot Dog Story, and I got put to work! Drew Bennett took the usual pile of really good pictures (as opposed to the blurry, low resolution ones I shoot) and they will be up on the Hot Dog Stories Facebook Page. I am still catching up on the videos after last weekend's computer disaster, I hope to be caught up by the end of this weekend. Get the full story of our visit to Snappy Dogs on Hot Dog Stories.